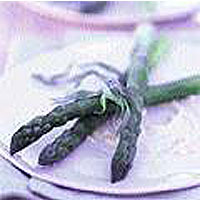 Cut off the woody parts of the asparagus and pare off the tough skin on the lower stems. Find a saucepan wide enough to hold all the asparagus lying down, and fill with water. Bring to a rolling boil. Put the shallot, tarragon, Noilly Prat and lemon juice in a small, non-reactive pan. Boil until the liquid has reduced to 3 tablespoons. Add the cream and boil until it has thickened slightly. Reduce the heat and whisk in the butter, a little at a time - it will form an emulsion. Make sure the sauce doesn't boil at this stage or it will split. Season to taste, then keep the sauce warm by placing the saucepan in a larger pan of very hot water. Salt the boiling water and add the asparagus. Cook for about 4 minutes or until just tender. Drain, dry on kitchen paper then arrange on warm plates. Strain the sauce and serve immediately with the asparagus.